Losing someone you love is a traumatic, heartbreaking event and that pain is made only worse when the victim is young with their whole lives ahead of them. A tragic example can be found in the deadly collision between an Amtrak train and a pedestrian near Woodland Drive in Jacksonville. The victim was discovered to be a Fleming Island High School student, according to WOKV.com. The Amtrak train was carrying 329 passengers at the time of the collision. No injuries were reported by passengers or crew members on board. You may be surprised to learn that accidents involving large freight trains and commuter rail trains are quite common. For example, the Federal Railroad Administration reported close to 12,000 train accidents at railroad crossings in 2014. Those accidents resulted in more than 800 deaths and tens of thousands of bodily injuries. In Florida, the data is not much better. The number of Floridians who lost their lives in train track accidents increased in 2017 throughout South Florida. According to the Sun Sentinel, 23 people died in train accidents in Miami-Dade, Broward and Palm Beach counties. That is close to double the number of fatal train accidents during the same period in 2016. If you or a family member was seriously injured in an accident involving a train, you may be able to take legal action against the railroad company if there is evidence of reckless or careless conduct, or negligent maintenance of a rail crossing. Under federal law, railroad companies are legally obligated to engage in interstate commerce and travel as safely as possible. Evidence of careless or irresponsible conduct can be sufficient to show a breach of this legal duty. If a railroad breaches a duty of care, they can be held liable for your harms and losses. Railroad companies are required to have a black box in each of their locomotives. This is a device that retains important information such as the trains’ speed, velocity, whether brakes were applied, etc. 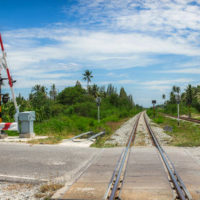 When you hire a Jacksonville train accident lawyer, they can take action and immediately issue a preservation letter to retain this vital evidence. Pain, suffering, mental anguish, etc. If you were badly injured in an accident involving a train, take action now and contact Gillette Law P.A. in Jacksonville. Our legal team is ready and able to help. Contact our office today to schedule a free, confidential consultation.